Grid highlighting upcoming posts of the various facilities that served the Pennsylvania Railroad in Harrisburg. Dating back to the original charter of the Pennsylvania Railroad in 1846, Harrisburg has long been host to the Standard Railroad of the World, beginning with the original mainline from the State Capitol, west to the city of Pittsburgh. Under the leadership of J. Edgar Thompson the PRR expanded South to Baltimore and North to Williamsport via control of the Northern Central Railway. East to Philadelphia with connections to New York City via the failed State owned Philadelphia & Columbia Railroad and Harrisburg, Portsmouth, Mt Joy and Lancaster Railroad Company, and finally southwest by way of the Cumberland Valley Railroad. While this early hub of activity was growing, expansion would soon be needed to alleviate traffic through the busy terminal. Enter Alexander J. Cassatt and his landmark 1898-1902 system improvements carried out by Chief Engineer William H Brown. These improvements introduced standardization of the physical plant, the expansion to the trademark four track “Broadway” mainline, grade separation projects and construction of sophisticated junctions allowing continuous freight and passenger movements with minimal interruption. New terminals were also built to better suit the modern needs of a growing nation. When complete, Cassatt and Brown effectively re-engineered the PRR to carry the company through the future. 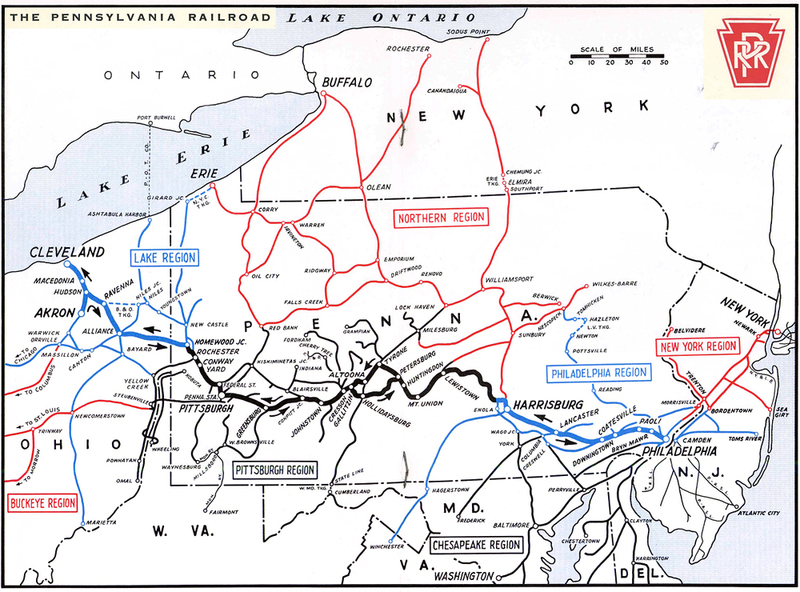 PRR system map circa 1957, illustrating the importance of Harrisburg among the connection of various Divisions. Later upgrades under PRR President Martin M. Clement completed electrification of both passenger and freight lines to Harrisburg in 1938, helping to increase travel times, capacity and reduce labor costs. At its peak, Harrisburg was a crossroads of four operating divisions the Williamsport, Middle, Philadelphia and Maryland Divisions, creating a hub where all destinations on the system could be accessed via various routing through the terminal area. The Harrisburg area flourished through WWII with the Enola Freight Terminal processing an all time record of 20,660 freight cars in one day in June of 1943! Post war traffic levels declined and the railroads were left with battered track, worn out equipment and new found competition from airlines and the tractor-trailer. As railroads tried to recover and rebuild, the downward slide continued, and on that fateful day of February 1st 1968 two long time rivals, the Pennsylvania Railroad and New York Central merged. Through continued financial problems, government regulations, and one massive incompatible system that was to big for the current rail market, the PC spiraled downward, and in 1970 made the record books, being the largest corporate bankruptcy case in U.S. history. This bankruptcy was the final step in spurring the effort of government intervention to save a struggling national passenger rail network, thus Amtrak was created removing the burden of passenger trains from the freight carriers. Finally while operating under bankruptcy protection the PC was organized into merger with six other bankrupt railroads to liquidate excess properties and form one solvent rail transportation network in the region. Beginning operations on April 1st 1976, Conrail rose from the ashes with a less than ideal start, but eventually became a successful private company serving the Northeast region with connections to Canada, the South, Detroit, Chicago and St Louis. Conrail map of the Harrisburg Terminal Area circa 1984. In the map it becomes evident how the PRR dominated the area over the Reading Company, which is represented by the line starting at Rutherford Yard and heading straight across(left to right) to the Lurgan Sub. This line today is what funnels Norfolk Southern traffic from the East. Amtrak lines are represented in dotted lines moving from Harrisburg proper to the South East (bottom right). Note all predecessor line are noted in parentheses. During the early 1980's several events took place that forever changed the relationship of Conrail and Amtrak operating on the Northeast Corridor. Amtrak’s tragic collision with a Conrail locomotive at speed in Chase MD caused fall out nobody could have expected and accelerated the push for the separation of freight and passenger traffic in many regions where they would once routinely share the road. Conrail shifted remaining traffic from New York and Philadelphia off the PRR mainline (now Amtrak’s Harrisburg Line) and the Atglen and Susquehanna Branch to the former Lehigh Valley and Reading Company mainlines. Electrified freight service was discontinued and a major consolidation of facilities took place. While the Reading main became the choice line to Harrisburg, Enola Yard survived as the railroad's primary terminal in the area. Conrail later focused on redeveloping the Harrisburg Yard for intermodal trains and run through re-crew and refueling facilities. Tracks were stripped from the Cumberland Valley Bridge favoring the neighboring Reading viaduct over the Susquehanna River and the remains of the PRR Hagerstown Line became a branch ending near Carlisle PA, with a new connection to the Reading Lurgan Sub in Camp Hill. Though the Columbia and Port Deposit still funnels freight to Baltimore via the Amtrak connection at Perryville, Maryland freight activity is limited to a night time window to avoid passenger traffic on the line. Today after the Conrail split between eastern giants Norfolk Southern and CSX Transportation, the dust settled and NS prevailed on the former PRR / Reading properties in Harrisburg. Enola has been rebuilt and is used for blocking and classification of freights while the Harrisburg yard and the former Rutherford Facilities (Reading) are used for intermodal and crew changes. Amtrak has just completed a major rebuild of the Keystone Corridor to Philadelphia and for the first time in 20 years the electric traction system is used regularly for hourly service with Amtrak’s venerable AEM-7s and tubular Amfleet cars, capped with rebuilt Metroliner cab cars for push pull operation. The beautiful Harrisburg train station still retains its herringbone brick platforms and original 1887 train shed serving as the western anchor for the New York - Harrisburg service and the daily round trip of the Pennsylvanian, the last remaining passenger train to make the trek over the former PRR mainline west to Pittsburgh. Next time we will begin to explore the key points and facilities in the Harrisburg area, to understand how the PRR managed traffic through this busy area and how facilities function today in Norfolk Southern's transportation network.